Ashley and Nathan’s wedding invitations from Jill at Lemon Tree Paper Co. feature burlap and kraft paper – the perfect combination for a rustic fall wedding! Ashley and Nathan’s wedding will take place in Tennessee later this month, so Jill also incorporated hand-sewn burlap pockets with a custom rubber stamp, adding the kraft paper address labels on the outer envelopes for a finishing touch. So cute! From Jill: These invitations were made to reflect a classic fall barn wedding. Ashley wanted a rustic feel, but with personal touches and unique qualities. I sewed each of these burlap pockets individually, and stamped them with a custom rubber stamp that I designed just for them. Ashley and Nathan plan to use the stamp throughout their wedding decor. We also used kraft paper wrap-around address labels to complement the rustic feel of the burlap. Check out the Designer Rolodex for more tal­ented wed­ding invi­ta­tion design­ers and the real invi­ta­tions gallery for more beau­ti­ful cus­tom invitations! I love these! The burlap pouch, the different fonts used and the hand stamping make them just perfect for a barn wedding with style! These are SO great. 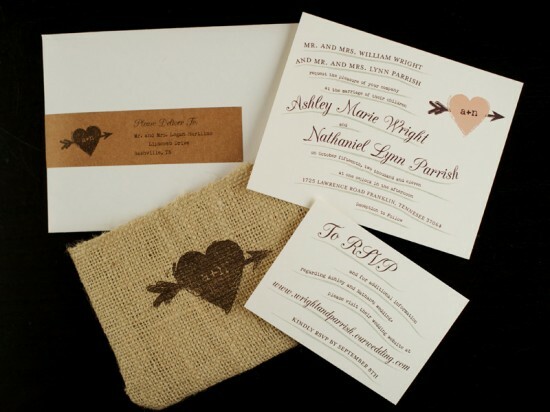 Love the burlap stamped bags, the arrow & heart icon, and the craft paper wrap. Such cute and unique touches to an invitation suite. What an unusual material – and so perfect for the theme. So cute, unique and I love it. Good Job! !